The 2018 Meijer LPGA Classic will host a full field of 144 of the best women golfers for 72 holes of stroke play over four days of competition. Proceeds from the tournament will once again benefit the Meijer Simply Give program. The Meijer LPGA Classic for Simply Give offers world class golf and events for the entire family to enjoy, while raising money and awareness around hunger relief. The Grand Taste is the best food experience on any tour. It’s a three-day food tasting event for the entire family that features samples from local restaurants, breweries, Meijer vendors and Meijer products and food trends. Volunteer registration is open for the 2018 Meijer LPGA Classic for Simply Give. Tournament officials are seeking more than 700 volunteers to fill roles on 22 different committees, ranging from marshals and standard bearers to transportation and assisting inside the media center. Meijer President and CEO Rick Keyes announces the retailer's $1 million donation goal for the fifth annual Meijer LPGA Classic for Simply Give. President & CEO Rick Keyes shakes hands with a local food pantry partner on Meijer LPGA Classic media day. Proceeds from the tournament will benefit the Meijer Simply Give program, which restocks the shelves of food pantries across the Midwest. The Meijer LPGA Classic raises funds for the Simply Give program, which helps restock food pantry shelves across the Midwest. The new Grand Taste Garden adds 5,000 square feet of food, music and family fun to this year’s tournament. Maddie McCrary tees off while practicing on Monday. Sponsor exemption Allyson Geer tees off while practicing on Monday. Emily Pedersen practices on the course at Blythefield Country Club. Moriya Jutanugarn practices on the course at Blythefield Country Club. Sponsor exemption Allyson Geer practices at Blythefield Country Club. Olafia Kristinsdottir takes a break to play the piano at Blythefield Country Club. Young golf fans participate in a junior clinic at Egypt Valley Country Club. A local golf pro teaches children how to putt at the junior clinic. Meijer LPGA Classic volunteers take a break during the junior clinic at Egypt Valley Country Club. Young golf fans pose for a photo during the junior clinic. The Grand Taste food truck serves lunch at the Meijer LPGA Classic junior clinic. Junior clinic attendees pose for a photo before the activities begin. A local golf pro teaches a child how to drive at the junior clinic. Volunteers serve lunch out of the Grand Taste food truck at the junior clinic. A young golf fan's hat was autographed at the junior clinic. Day two of the Meijer LPGA Classic began with a celebrity pro-am, which took place at Egypt Valley Country Club. P&G sponsors the Meijer LPGA Classic junior clinic and celebrity pro-am. Former NFL wide receiver Herman Moore signs an autograph for fans at the celebrity pro-am. ESPN co-host Trey Wingo is interviewed at the celebrity pro-am. Former NFL linebacker Dhani Jones enjoys himself at the celebrity pro-am. At the Meijer LPGA Classic pairings party, guests enjoy cuisine from past champions’ home countries. Delicious cuisine prepared for the Meijer LPGA Classic pairings party. Jeong Eun Lee, So Yeon Ryu, Mirim Lee, Mi Jung Hur and Amy Yang pose for a photo at the pairings party. Defending champion Brooke Henderson attends the Meijer LPGA Classic pairings party. LPGA professional Lexi Thompson attends the Meijer LPGA Classic pairings party. Celebrity Chef Dean Fearing and Eric Dreyer pose for a photo with a guest. The Meijer LPGA Classic raises funds for the Simply Give program, helping restock food pantry shelves across the Midwest. LPGA Professional Brittany Benvenuto visits a local food pantry with Executive Chairman Hank Meijer. North Kent Connect Executive Director Claire Guisfredi gives Meijer Executive Chairman Hank Meijer and LPGA Professional Brittany Benvenuto a tour of the food pantry. North Kent Connect Executive Director Claire Guisfredi gives Executive Chairman Hank Meijer and LPGA Professional Brittany Benvenuto a tour of the food pantry. Maranda of Maranda Where You Live interviews Meijer President & CEO Rick Keyes. The official pro-am takes place on day three of tournament week. A caddy keeps score during the official Meijer LPGA Classic pro-am. Michelle Wie lines up a putt during the official pro-am. Cheyenne Woods prepares to tee off during the official pro-am. Official pro-am participants enjoy an outdoor barbeque together. Official pro-am participants and tournament partners enjoy an outdoor barbeque. Musicians play a song for guests at the Meijer LPGA Classic partner barbeque. Rick Keyes, Denny Belcastro, Jay Gottlieb, Glen Smith pose with So Yeon Ryu during the official pro-am. LPGA professional Morgan Pressel greets young fans during the official pro-am. Defending champion Brooke Henderson’s golf bag. Official pro-am participant Daniel Gannon after making a hole-in-one. LPGA professional Lexi Thompson golfs during the official pro-am. Meijer LPGA Classic for Simply Give volunteers check out pairings for the official pro-am. LPGA professional So Yeon Ryu signs an autograph for a young fan. A young fan had their hat autographed at the official pro-am. Proceeds from the Meijer LPGA Classic for Simply Give will benefit food pantries across the Midwest. The annual tournament takes place at Blythefield Country Club. LPGA professional Paula Creamer prepares to putt during the official pro-am. LPGA professional Paula Creamer rests a flag against her golf bag during the pro-am. LPGA professional Lydia Ko celebrates during the official pro-am. LPGA professional So Yeon Ryu golfs during the official pro-am. The Meijer LPGA Classic for Simply Give’s supporting sponsors. LPGA professional Robynne Ree takes a shot during day one of tournament play. The crowd cheers on a player from the sidelines of the Meijer LPGA Classic. Volunteers serve up snacks at the Meijer LPGA Classic. The crowd watches LPGA professionals golf at Blythefield Country Club. LPGA professional Lexi Thompson hits her ball out of a sand trap. LPGA professional Lexi Thompson sets up for a putt. LPGA professional Cheyenne Woods putts on day one of tournament play. LPGA professional Aditi Ashok greets a volunteer. Round one of tournament play kicked off on Thursday, June 14. Defending champion Brooke Henderson golfs on day one of tournament play. The Meijer LPGA Classic is an event for the entire family. LPGA professional Lexi Thompson tees off at the Meijer LPGA Classic. LPGA professionals Su Oh and Danielle Kang walk through the course near Discovery Land. LPGA professional Annie Park on day one of tournament play. Spectators watch the tournament from the PepsiCo viewing tower. Spectators grab lunch inside the PepsiCo viewing tower. The tournament welcomes young golf fans to the enhanced Kid’s Center – Discovery Land – which features Nickelodeon, Hasbro, Universal Studios and STEM-related activities and characters. Young golf fans meet Marshall from Paw Patrol at Discovery Land. Children enjoy Discovery Land at the Meijer LPGA Classic. A young golf fan has her hair styled inside Discovery Land. A child plays a game at the tournament’s Discovery Land. Discovery Land features Nickelodeon, Hasbro, Universal Studios and STEM-related activities. 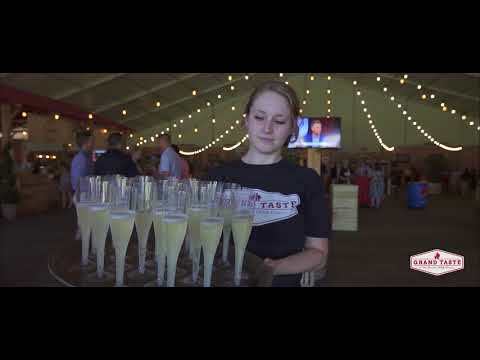 The Grand Taste features food from dozens of local restaurants, breweries, Meijer vendors, products and food trends. Meijer Woodfired Pizza is served at the Grand Taste. Tournament attendees enjoy the Grand Taste Premiere Night. Chef Katie Brown makes her first appearance at the Grand Taste to perform a cooking demonstration. Sarah Kaufmann, “The Cheese Lady,” is back for her second year at the Grand Taste. Sarah Kaufmann, “The Cheese Lady,” carved a Meijer LPGA Classic cheese sculpture. Corn dip from Donkey Taqueria is served at the Meijer LPGA Classic Grand Taste tent. Meijer chefs prepare hors d’oeuvres for Grand Taste guests. Food prepared for the Grand Taste at the Meijer LPGA Classic. LPGA professional Morgan Pressel tastes the cuisine at the Grand Taste. Food from local restaurants, breweries, Meijer and Meijer vendors is served at the Grand Taste throughout the weekend. Meijer employees, vendors and local restaurants serve food at the Grand Taste. Pernilla Lindberg prepares to putt. Spectators watch an LPGA pro tee off at Blythefield Country Club. Spectators watch the tournament from viewing towers throughout the course. In Gee Chun pitches her ball onto the putting green. Lexi Thompson sets up for a shot with her caddy. Sakura Yokomine tees off at Blythefield Country Club. Caroline Masson putts on day two of tournament play. Nelly Korda signs an autograph for a fan. Moriya Jutanugarn greets a Meijer LPGA Classic volunteer. Pernilla Lindberg signs an autograph for a young fan. Young golf fans cheer on LPGA pro Lexi Thompson. So Yeon Ryu autographs a young fan’s hat. LPGA pro Lexi Thompson poses for a photo with a young fan. Meijer LPGA Classic volunteers pose for a photo. Amy Yang sets up a putt on day two of tournament play. So Yeon Ryu tees off. Lexi Thompson poses with a Meijer LPGA Classic volunteer. Su Oh hits a drive at the Meijer LPGA Classic. A young volunteer at Blythefield Country Club. Nelly Korda hits a drive on day two of tournament play. Nelly Korda and Lydia Ko pose for a photo at the course. Lydia Ko prepares to putt at Blythefield Country Club. Spectators watch as Lexi Thompson tees off. In Gee Chun hits her ball of out the sand trap. Notre Dame football coach Brian Kelly announces players and tee times at Hole 1. Notre Dame football coach Brian Kelly with tournament staff. A child plays putt-putt golf at Discovery Land. Meijer LPGA Classic volunteers pose for a photo with the Trolls at Discovery Land. Paw Patrol characters visit Discovery Land at the Meijer LPGA Classic. SpongeBob says hello to a child at Discovery Land. Sarah Kaufmann, “The Cheese Lady,” conducts a cooking demo at the Grand Taste Garden. Sarah Kaufmann, “The Cheese Lady,” poses with her sculpture of Brooke Henderson. Tournament spectators visit the Grand Taste at the Meijer LPGA Classic. Chef Katie Brown hosts a cooking demo at the Grand Taste Garden. Founders Brewing Co. hands out hors d’oeuvres at the Grand Taste Garden. Guests enjoy food and beverages at the Grand Taste Garden. Great Scott! performs at the Grand Taste Garden. Crowds gather to watch the Meijer LPGA Classic for Simply Give. Azahara Munoz celebrates a putt with her caddy. Anna Nordqvist signs an autograph for a fan. Spectators wait to greet LPGA professionals at Autograph Alley. So Yeon Ryu poses for a selfie with a young fan. Kris Tanulis tees off at Blythefield Country Club. Kelly Shon sets up a putt at the Meijer LPGA Classic. So Yeon Ryu tees off at the Meijer LPGA Classic. Kelly Shon putts at Blythefield Country Club. Anna Nordqvist celebrates after sinking a putt. Anna Nordqvist poses for a photo with young fans. The Meijer LPGA Classic 5k Run & Walk took place on Saturday. A young runner high-fives Tony the Tiger as he finishes the kids race. Tony the Tiger high-fives a runner as she finishes the race. A volunteer at the Meijer LPGA Classic 5k Run & Walk. Johnny Agar poses for a photo at the Meijer LPGA Classic 5k Run & Walk. Johnny and Jeff Agar participate in the Meijer LPGA Classic 5k Run & Walk. Former Olympian Dathan Ritzenhein poses with his children at the 5k Run & Walk. Dathan Rizenhein and a guest pose with Executive Director of the Meijer LPGA Classic Cathy Cooper. The winner of the women’s 5k Run & Walk crosses the finish line. The winner of the men’s 5k Run & Walk crosses the finish line. Young runners at the Meijer LPGA Classic 5k Run & Walk. Celebrity chef Carla Hall conducts a cooking demo at the Grand Taste Garden. Celebrity chef Carla Hall lets a Grand Taste guest taste her dish. A chef from Hissho Sushi conducts a cooking demo at the Grand Taste. Grand Taste attendees watch Carla Hall’s cooking demo. Guests enjoy the Grand Taste Garden at the Meijer LPGA Classic. Bluewater Kings Band performs at the Grand Taste Garden. Guests enjoy the Grand Taste. A Meijer chef conducts a cooking demo at the Grand Taste Garden. Ellen Bruisma is awarded the XL Catlin LPGA Volunteer Service Award. So Yeon Ryu sets up for a putt on the final day of tournament play. So Yeon Ryu celebrates after sinking the tournament-winning putt. So Yeon Ryu poses with Meijer President & CEO Rick Keyes and a food pantry partner. Meijer President & CEO Rick Keyes congratulates So Yeon Ryu for winning the Meijer LPGA Classic. Meijer President & CEO Rick Keyes presents a $1.1 million Simply Give donation to a food pantry partner. So Yeon Ryu poses with her trophy. So Yeon Ryu poses with Meijer President & CEO Rick Keyes.